Yamaguchi Prefecture (山口県, Yamaguchi-ken) is a Japanese prefecture at the western end of the Chūgoku region on the island of Honshū. The capital is the city of Yamaguchi. 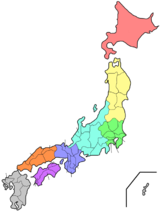 The area of Yamaguchi Prefecture includes the old provinces of Suō and Nagato. Yamaguchi is at the southern end of Honshū. The Sea of Japan forms its northern coastline; and the Seto Inland Sea is on its southern coast. Its northeastern border meets Shimane Prefecture and Hiroshima Prefecture. ↑ Nussbaum, Louis-Frédéric. (2005). "Yamaguchi-ken" in Japan Encyclopedia, pp. 1039-1040; "Chūgoku" at p. 127. ↑ Nussbaum, "Yamaguchi" at p. 1039. ↑ Japan Ministry of the Environment, "General overview of area figures for Natural Parks by prefecture"; retrieved 2012-8-26. ↑ "Nationwide List of Ichinomiya," p. 3; retrieved 2012-8-26.